Mardenborough won in Germany. © Sam Bloxham/GP3 Series Media Service. If the heavy heat still bore down on the Hockenheim paddock, then at least delight and relief cleared the air. For Jann Mardenborough, this was all about the latter. His performances during this year’s Toyota Racing Series showed that he had the capacity to win, but taking that to a higher level like GP3 was always going to be tricky. 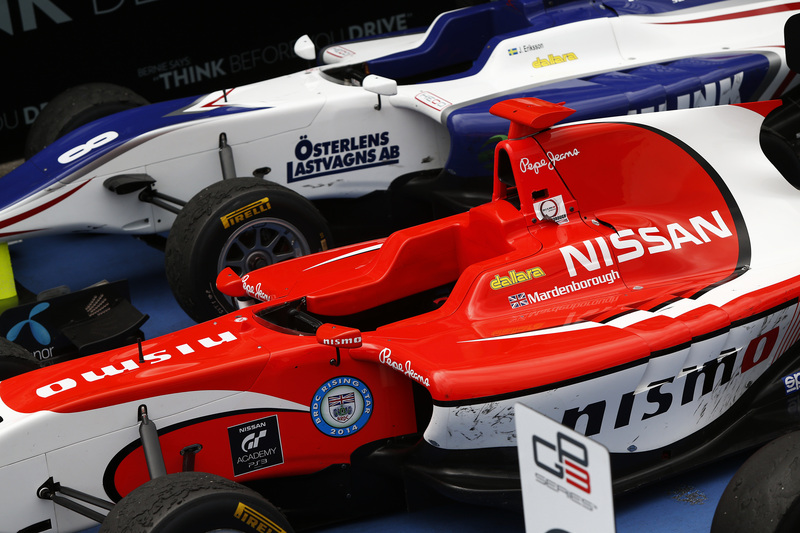 Emerging victorious from the Nissan GT Academy in 2011, Mardenborough has spent the last three seasons years carving out a strong reputation in motor racing. Whether that is the British GT Series, European Formula 3, Blancpain Endurance Series or GP3, there is little doubt that Mardenborough’s confidence is growing. Of course, there are still weaknesses and he knows it. Mardenborough needs to work on his qualifying pace. Although the Briton secured the 5th best time in Silverstone, the Arden racer has typically qualified well outside the top ten and for all his quick race pace, his overall placement is diminished when he starts so far down the order. But surely that is the whole of these junior categories? While results are clearly important, the opportunity to learn must be paramount and the 22-year-old is doing just that. “It’s just getting everything right in Free Practice,” said Mardenborough following the second race at Hockenheim. The turnover time is short and Arden have much to do; however there is little doubt that they can guide Mardenborough. After delivering GP3 drivers’ titles with Mitch Evans and Daniil Kvyat, the team run by Christian and Garry Horner can do the job, but it is up to Mardenborough to pick up the baton and run with. From here, it looks as if his pace is only just picking up. “It means something really special to me to win here at my home GP.” No one can deny there is something special about taking victory on home soil in an international series. For GP3 Series rookie Marvin Kirchhöfer, that became a reality on Saturday when he scored his first series win mere hours after securing his maiden pole position. “I knew it was just the first part of the job and to finish it, I had to make a good start and stay strong and focused,” said the reigning German F3 champion. Kirchhöfer also scored the fastest lap of the eighteen-lap race, with the bonus points propelling the 20-year-old into 3rd in the championship stakes. Although Lynn maintained close proximity throughout, Kirchhöfer rarely appeared threatened under the tough Hockenheim heat, with the winner pointing towards a new direction during the Friday early-evening practice session. However practice is one aspect; the race itself – held at a similar time on Saturday – was going to be a much tougher prospect. “In the beginning it was quite difficult,” Kirchhöfer said. With a clean start, the ART Grand Prix racer held the lead at just over one second for the opening two-thirds of the race, before extending the gap to almost four seconds during the final six tours. “The first two laps were clear and it was a normal pace, but then we had yellow flags. When it was green I could show my real pace…” There was no denying Kirchhöfer’s pace. In the final few laps, the German showed Lynn a clean pair of heels. Despite a track temperature that hovered around the 50°C, the tyres largely held intact, promoting something of static race in the higher order. With the frontrunners generally holding a set pace, few overtaking opportunities were presented. “Our pace was quite good,” commented Kirchhöfer, adding “For sure we didn’t have the same car as we did in the beginning but I was quite happy with the evolution of the tyres.” Such confidence from a driver allowed to race in a tyre that can do the distance can be a humbling thought for one’s competition. Lynn, meanwhile, operated in a sort of limbo. “The tyres were going off – as we expected them to do – so I was struggling quite a lot.” Hamstrung by an ill feeling car, as his Pirelli’s fell away following his early challenge on the leader, the Carlin man was getting wayward with grip. Following his exploits, Lynn said, “It was probably the hardest race of the year. There was still some luck though, as Lynn’s teammate Bernstorff was in a similar predicament; however he is keenly aware of where he lost the race for the runner-up spot. “I took too much out of the tyres at the beginning but towards the end I think everyone was struggling a bit.” Bernstorff held on to the leading pair admirably, with the Carlin man finishing just 4.4s down on the eventual victor. Behind the front three, Nick Yelloly finished 4th, but the Status Grand Prix man could not keep with the tougher pace. The race was less profitable for Dino Zamparelli, whose pace collapsed in the final two laps, leading to Dean Stoneman to slip by into 5th before the flag. Title challenger Jimmy Eriksson drove a solid race to 7th, gaining three places during the eighteen laps, including two off the line. The Swede had the next position handed to him by an errant Mathéo Tuscher, who momentarily fell off the circuit on the twelfth tour. Tusher’s made a second error on the following lap, allowing Nissan GT Academy winner Jann Mardenborough in the frame. By this point, the charging Mardenborough had already made moves on Luis Sá Silva (lap 7), Mitch Gilbert (lap 8), Robert Visoiu (lap 13) and Richie Stanaway (lap 15), before taking Riccardo Agostini two laps from the end. Mardenborough’s late burst also gives him reverse grid pole for the Sunday morning Race Two. Agostini hung on to claim 9th, while Visoiu passed Stanaway three laps from the end to make sure of the last points paying position. The race was not without other action. Alfonso Celis Jr and Ryan Cullen clashed on the 2nd lap at the hairpin – Celis Jr received a three-place grid penalty as a result. Also Sebastian Balthasar made silly contact with Nelson Mason, also in the hairpin, three laps from the end. Sweat? Barely a bead. Of course, that is not strictly true, but considering the events of the previous thirty minutes it may as well have been. “It was a controlled race,” said Mardenborough, his overalls now tucked away and his helmet stored safely. 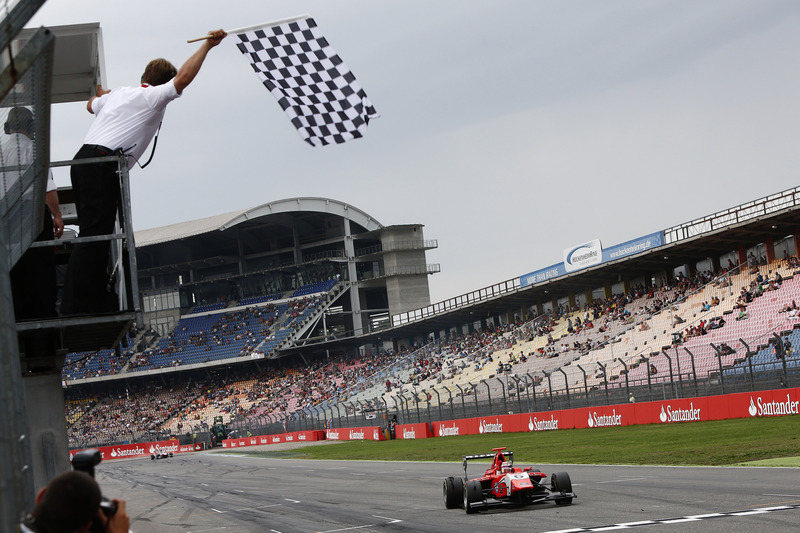 Sunday morning at the Hockenheimring and the Nissan GT Academy winner had just taken his first GP3 Series victory – and it was controlled race, as he drove a cool and calm race to lead every lap ahead of Zamparelli and Eriksson. 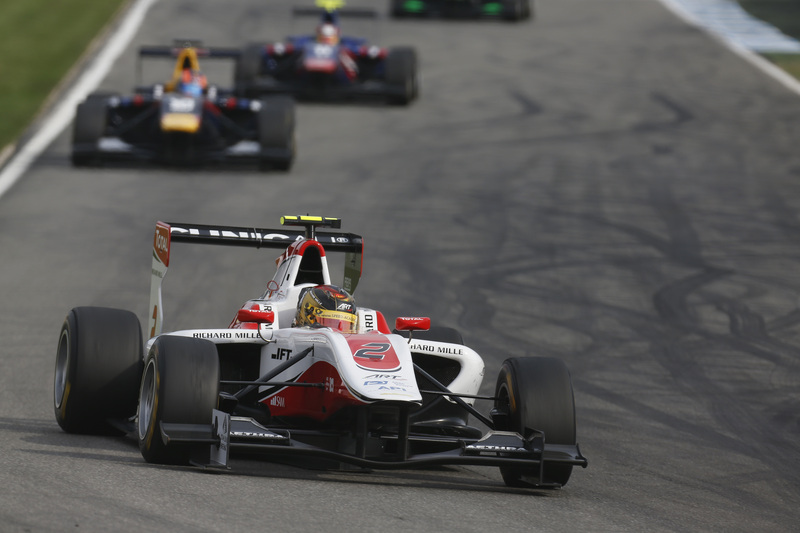 This was also the first victory of the season for Mardenborough’s Arden International squad. There will be those who dismiss these Sunday results from time-to-time, noting their reverse grid status and calling cheap their result. Those critics may have a point – to a degree – but come lights out, these cars still need to driven and the races won, irrespective of the sporting regulations. Come the final morning of the weekend, droplets of rain had fallen, but nowhere near enough to effect the racing too drastically; however the air had cooled significantly since Saturday, offering the field the opportunity to race that little bit harder. With the laps ticking down, Eriksson also fell away from the leading pair, as he sought to protect a rearguard action by championship leader Alex Lynn. The Red Bull junior made a great start to jump into 4th from 7th on the grid; however once under the wing of Eriksson, there was little the Essex man could do. In the end, it mattered little. Unlike Zamparelli, Eriksson was deemed to have not slowed down enough for the early yellow flag zone, something upon which the stewards took a dim view as they slammed the Swede with a 20s post-race penalty. Eriksson was not impressed by the decision. “In my opinion, the penalty handed out to me […] was extremely severe, and I do not agree with the view of the stewards. I respected the yellow flags by braking much earlier than normal, I backed off significantly as indicated by the sector time, and nothing actually happened – I think the penalty is out of proportion.” The stewards were unmoved by Eriksson’s protestations and the Koiranen GP racer was demoted to 15th overall. Dean Stoneman was classified 4th, but certainly made life difficult for himself. A poor start from the second row dropped the Briton down 6th, with Emil Bernstorff demoting Stoneman one place further on the second lap. Stoneman gained that position back on lap seven, when the overly aggressive Marvin Kirchhöfer made an unrealistic attempt at an overtake on Bernstorff at the hairpin, which removed both competitors from the action. Kirchhöfer was also on the receiving end of a penalty, with the Race One winner handed a five-place grid penalty for the first race in Hungary. It allowed Stoneman to assume a top-five position, which would eventually become 4th following Eriksson’s penalty. Nick Yelloly brought his Status Grand Prix machine home in 5th place. Starting 5th, the Englishman held the place until five laps from the end when, under pressure from Stoneman, Yelloly dropped behind the Marussia Manor pilot. Yelloly shadowed Stoneman to the end, but the challenge proved too great, although he too would move up a place in the classification. Patric Niederhauser scored four more useful points for Arden International in what was a quiet, but solid race. The Swiss driver moved from 12th on the grid to 9th on the opening tour and collected two more positions when Kirchhöfer, Bernstorff and Eriksson were removed from the action. Richie Stanaway finished 7th in the Status Grand Prix machine. Like Niederhauser, Stanaway gained several spots on the opening lap, before taking Robert Visoiu on the 2nd tour. The Kiwi also gained three positions form the Kirchhöfer and Eriksson mistakes, but had to work hard to keep the aggressive Riccardo Agostini behind him on the final lap. In the end, Stanaway pipped his Italian rival by three-tenths, but Agostini was close – very close – but collected a point regardless. The events of Hockenheim have helped Lynn extend his points lead further over Eriksson, but with the gap at 30 points, the championship is still relatively tight. Kirchhöfer’s Saturday victory may have brought into the battle, but accidents like the one on Sunday could also keep him out of it. Kirchhöfer won the Saturday opener. © Sam Bloxham/GP3 Series Media Service. Eriksson’s and Mardenborough’s machines in Parc Ferme. © Sam Bloxham/GP3 Series Media Service.